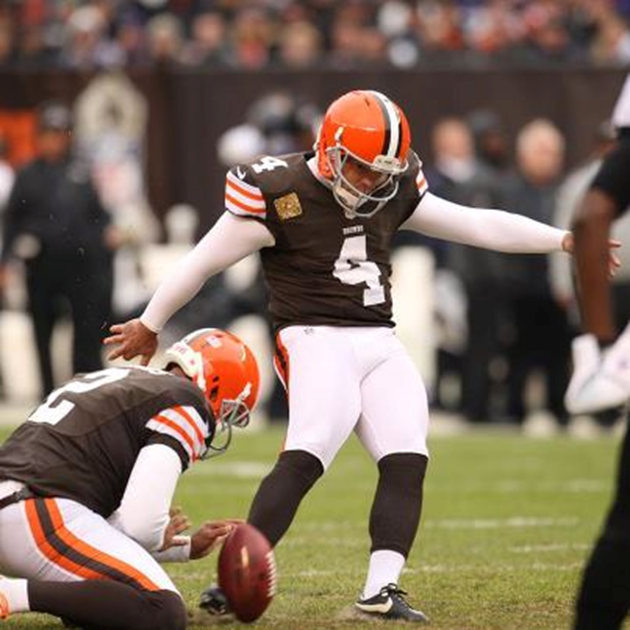 CLEVELAND — Veteran kicker Phil Dawson accounted for every one of the Browns’ points in Sunday’s 25-15 loss to the Baltimore Ravens. Dawson made five field goals in five attempts — splitting the uprights from 32, 28, 29, 33 and 41 yards — despite the poor field conditions at Cleveland Browns Stadium. Though the Browns’ season has been fatally flawed, Dawson has been perfect, making 17 of 17 field goals and 16 of 16 extra points for a team-leading 67 points. He also has connected on his last 23 field goal tries, dating back to 2011. Adding to the level of difficulty, the playing surface got progressively worse because of the rain it absorbed during Superstorm Sandy. Dawson said his approach was slower than usual because it was difficult to maintain solid footing. The second-leading scorer in Browns history still managed to go 5-for-5 for the third time in his 14-year NFL career. Dawson also owns one 6-for-6 performance on Nov. 5, 2006, at San Diego. “The field was obviously not ideal, but our grounds crew deserves a tremendous amount of appreciation for getting it in as good of shape as they did,” he said.